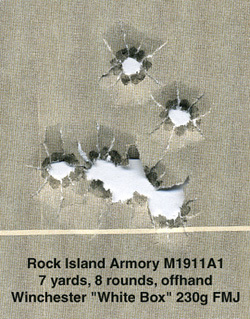 Recently, I purchased a new Rock Island Armory .45 at the big gun show in Houston about a month ago. When I went to the show, I was impressed at how the show was oriented more towards the military style self defense kind of guy than just something for everyone. SKS’s and AK’s were everywhere and so were a lot of good deals. But the buyer definitely had to know what they were viewing and a real idea of actual costs. So, I had recently mentally armed myself with the most recent reviews and costs of various guns and ended up with a new Rock Island Armory .45 which is parkerized in black which really caught my attention. I paid a small $300 for it. I felt very good about the purchase and checked the handgun as well as possible at a gun show, but was it a cool deal or not? 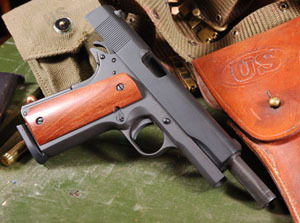 Well, I immediately went to a black finger grooved pistol grip by Hogue. Now, it is totally black in appearance and most likely why I will misplace it one day. Not hardly. Anyhow, I cleaned the gun down to military specs. and oiled and greased as required. I then took it out for a real shooting. I bought several off the shelf brands of ammo and set up the targets and went to work. I and two friends took turns blasting several pistols all afternoon. The Rock Island held up like a champ and went through over ten boxes and never missed a beat. I kept waiting for stove tops and so on, but it never happened. It shot where you aimed and shot very good groups. I really was worried about this .45 needing to be tweaked and was ready to order whatever I needed to fix any problems I encountered. I was concerned with “you get what you pay for” coming back to haunt me. But nothing bad or negative occurred. After having taught over four years with many students in the concealed handgun carry course, I know that new guns can perform like crap and it happens even to the best and most expensive. But for this .45, I would not hesitate to buy a second or third. It made a believer out of me. Now, is this cool or what and cheap? No, I am not a gun promoter or affiliated with the Houston gun show. I am just a consumer.